One of the truly unique musical voices of the last ten years, Godspeed You! 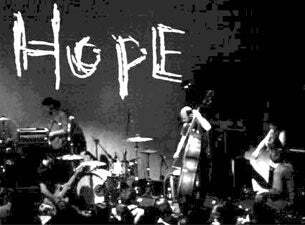 Black Emperor burst on the scene with their first album Infinity. Opening track The Dead Flag Blues, with its gravely monologue (rumoured to be the voice of Lee Marvin) paved the way for things to come. Comprising three guitarists, two bassists, a drummer, a percussionist, a cellist and a violinist (although the line up frequently changes) GY!BE make instrumental music that manages to veer effortlessly between monumental punk-rock dirge and sweet, melodic washes of orchestral harmony, like the soundtrack to the greatest film you've never seen. The band are notoriously avoidant of the media, and the inclusion of East Hastings in recent picture 28 Days Later seemed to happen more by accident than choice, but proved the perfect accompaniment to watching a man walk alone through the streets of London. The group haven't performed live in over four years, but when they do prove to be an unmissable experience, matching their apocalyptic soundscapes to haunting, looped film stock shot by the band.